Director Steve McQueen’s highly anticipated adaptation of 12 Years a Slave has been much-discussed since it went into production last year – and you can now get your first look at this gritty historical drama. This film seems like a surefire awards season contender, with its high-end behind-the-scenes pedigree (McQueen made quite a splash with Shame a couple years ago and Brad Pitt is a producer) and star-studded cast that includes several recognizable British performers. The ensemble cast features Chiwetel Ejiofor, Michael Fassbender, Benedict Cumberbatch, Alfre Woodard, Michael K. Williams, QuvenzhanÃ© Wallis and more, including Pitt himself as a Canadian abolitionist. Written by The West Wing alum Josh Singer, the film is based on the books Inside WikiLeaks: My Time with Julian Assange at the World’s Most Dangerous Website and Wikileaks: Inside Julian Assange’s War on Secrecy. Bill Condon, most recently of The Twilight Saga, is directing and has assembled an all-star cast that’s positively bursting with familiar faces and talent, including Daniel Bruhl, Laura Linney, Anthony Mackenzie, David Thewlis, Peter Capaldi, Dan Stevens and more. Translation: it’s got “awards bait” written all over it. Still and all though, since this movie is basically the reason that production on Sherlock Series 3 got pushed back, it better be excellent, right? Weigh in for yourself below and get your first look at Cumberbatch as Assange – yes, complete with trademark white-blonde hair. It’s a bit of an adjustment to be sure (and a look that I doubt will set many teenage girls screaming a la his appearance in Star Trek), but oddly, creepily Cumberbatch really does looks like Assange. 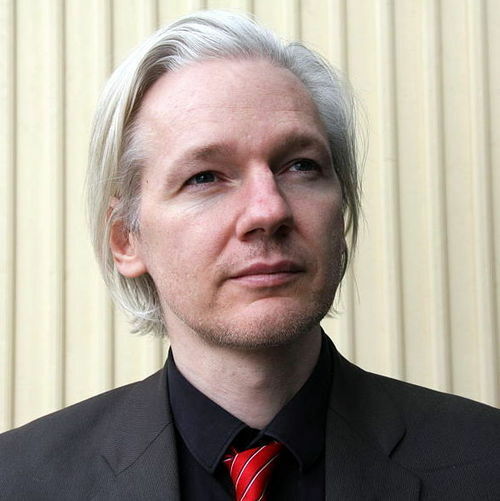 It’s merely unfortunate that Assange himself is, in fact, a bit creepy looking. See the larger version below.